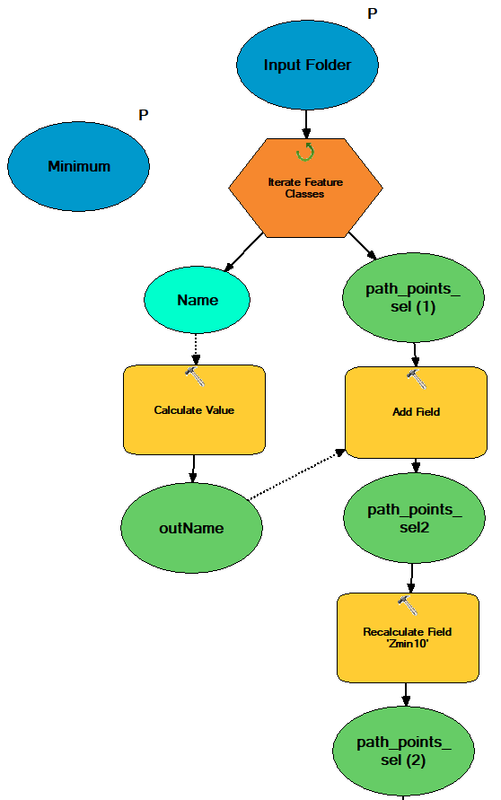 I have created a model in ArcGIS 10.2 that iterates through some feature classes in order to add a field 'Zmin10' (double) and calculate the field value based on a variable (called "Minimum") to which it adds a different value based on the feature class name ("outName"). For the other options, it always returns the value according to the "else" part of the statement, as if somehow it does not recognise the other values either. I do not understand exactly where the code is wrong and why. Browse other questions tagged arcgis-desktop modelbuilder field-calculator python-parser if-else or ask your own question. Using arcgis.rand() with variables from code block of Calculate Value tool? Replace occasional Space with Underscore using Python parser of ArcGIS Field Calculator? Using python to convert string values with Calculate Field in ModelBuilder? Using Python to convert string values with Calculate Field in ArcGIS ModelBuilder?